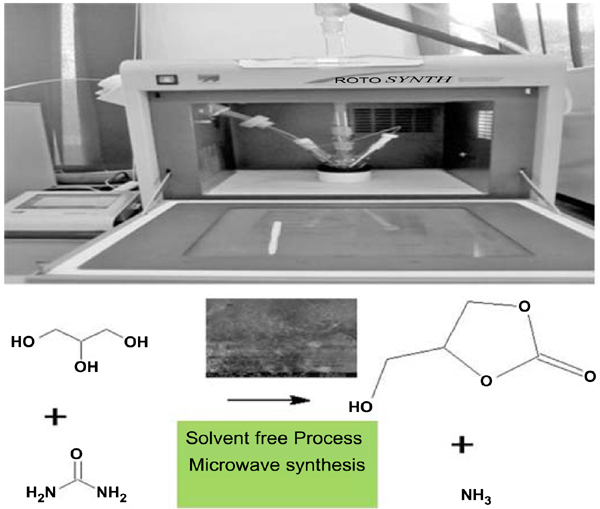 Background: Microwave (MW) assisted synthesis of chemicals and catalysts are considered as an environmentally friendly, faster and energy efficient approach than conventional heating methods. The aim of this paper is to demonstrate MW heating power for the synthesis of heterogeneous layered double hydroxide catalysts (LDHs) and evaluation of catalysts under MW reaction condition for glycerol carbonate synthesis in terms of time, temperature and solvent free approach. The work reported in the manuscript lies in understanding the effect of reaction environment along with optimized process condition and catalyst amount on the product profile during carbonylation of glycerol with urea using microwave. Methods: Microwave assisted synthesis of hydrotalcite catalysts with zinc, magnesium and aluminum metal ions was done by in situ co-precipitation method. The catalytic activities were tested for the synthesis of glycerol carbonate under microwave reflux condition using glycerol and urea and optimized. The products were separated from catalyst and characterized by 13C inverse gated NMR and quantified. Result: Layered double hydroxide catalysts incorporated with zinc show good conversion and selectivity towards glycerol carbonate formation. The reaction conditions are optimized with temperature, time, concentration and catalyst amount under microwave heating condition. Conclusion: Microwave assisted method has reduced synthesis time with good conversion and selectivity towards glycerol carbonate formation. The catalytic activity of Zn-Mg-Al layered double hydroxide with higher zinc content shows better activity and selectivity towards glycerol carbonate formation and comparable to literature reports with benefits of faster reaction time and low temperature and easy separation. Microwave, glycerol carbonate, hydrotalcite, solvent free synthesis, carbonylation, mesoporous.